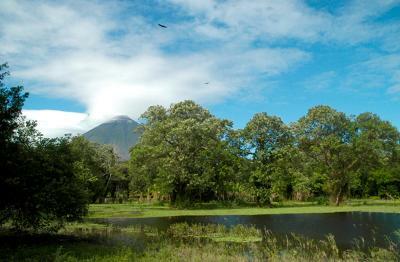 Located in Ometepe Island, Finca San Juan de la Isla is on a lake, within a 15-minute drive of Altagracia Monoliths and Ometepe Island Museum. 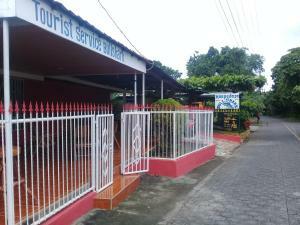 This lodge is 2.9 mi (4.6 km) from Ojo de Agua Park and 3.8 mi (6.1 km) from Santo Domingo Beach. Make yourself at home in one of the 18 air-conditioned guestrooms. Bathrooms have showers and complimentary toiletries. Conveniences include ceiling fans, and housekeeping is provided daily. Enjoy recreation amenities such as bicycles to rent or take in the view from a garden. Additional features at this lodge include complimentary wireless Internet access and tour/ticket assistance. At Finca San Juan de la Isla, enjoy a satisfying meal at the restaurant. Quench your thirst with your favorite drink at the bar/lounge. A complimentary cooked-to-order breakfast is served daily from 7 AM to 10 AM. When would you like to stay at Finca San Juan de la Isla ? Each day we'll check prices and send you an email for your selected dates at Finca San Juan de la Isla. If you don't have specific dates but would like to check prices for say next weekend or say next month we can check the price too. Click to write a review and share your experience of Finca San Juan de la Isla with other travellers.